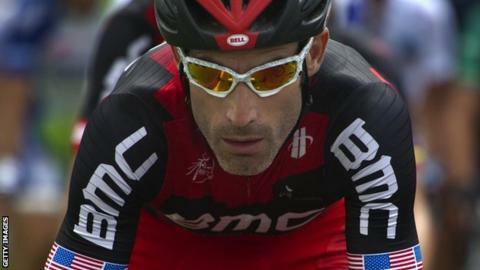 Lance Armstrong's former team-mate George Hincapie has admitted using performance-enhancing drugs. The American, who rode for the US Postal Service team, helped Armstrong win his seven Tour de France wins. "Given the widespread use of performance-enhancing drugs by cyclists at the top of the profession, it was not possible to compete without them," said the 39-year-old Hincapie. His testimony will further damage Armstrong's reputation. Hincapie was among 11 riders identified as having provided evidence to the United States Anti-Doping Agency (Usada) in its investigation into doping. In their report released on Wednesday, Usada said Armstrong's team ran "the most sophisticated, professionalised and successful doping programme the sport has ever seen". Hincapie, who retired in August, has joined a number of former Armstrong team-mates, including Floyd Landis and Tyler Hamilton, who have admitted to doping during their career. Armstrong has always denied using drugs but was banned for life in August after deciding not to fight the charges laid against him by Usada. Hincapie said: "Because of my love for the sport, the contributions I feel I have made to it, and the amount the sport of cycling has given to me over the years, it is extremely difficult to acknowledge that during a part of my career I used banned substances." He said he stopped using drugs six years ago and decided to come clean about his own past in a bid to restore credibility to the sport. "Two years ago, I was approached by US Federal investigators, and more recently by Usada, and asked to tell of my personal experience in these matters," he said. "I would have been much more comfortable talking only about myself, but understood that I was obligated to tell the truth about everything I knew. So that is what I did. "Cycling has made remarkable gains over the past several years and can serve as a good example for other sports. "Thankfully, the use of performance enhancing drugs is no longer embedded in the culture of our sport, and younger riders are not faced with the same choice we had." Another rider, Michael Barry, has revealed he was pressurised into taking performance-enhancing drugs by US Postal. "After being encouraged by the team, pressured to perform and pushed to my physical limits I crossed a line I promised myself and others I would not: I doped," said the 36-year-old Canadian in a statement on his website. "It caused me sleepless nights, took the fun out of cycling and racing, and tainted the success I achieved at the time. This was not how I wanted to live or race." Barry, who says he quit doping in 2006, said he decided to come clean after being contacted by Usada to help improve the sport for young cyclists. "From 2006 until the end of my career in 2012, I chose to race for teams that took a strong stance against doping," Barry added. "Although I never confessed to my past, I wrote and spoke about the need for change. "I apologise to those I deceived. I will accept my suspension and any other consequences. I will work hard to regain people's trust." BBC Radio 5 liveSport will have a special programme "Peddlers: Cycling's Dirty Truth" at 7pm on Monday looking at the whole Lance Armstrong saga including a full interview with Armstrong's former team-mate Tyler Hamilton.